The aerial action game will now be out in 2018. 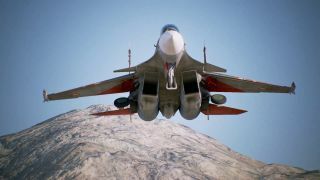 I'm not familiar with the Ace Combat series, but the newest trailer for Ace Combat 7: Skies Unknown—which, in case you missed it, is coming to PC—makes me want to rectify that. It offers a mixture of dramatic music, aerial combat, cod-philosophical musings, and reports from a war between fictional countries—also, there's a space elevator, and an army is occupying it, which is probably bad. We'll have to wait and see whether this is the extent of Bandai Namco's E3 Ace Combat 7 media, or whether we'll learn more about it at the show, but one new thing we have learned is that Ace Combat 7 will now be out in 2018, as mentioned on the company's Facebook page. Tekken 7, another big Bandai Namco game, released recently. Dave Houghton summarised it thusly in his review: "A smart, blisteringly fun experience at its core, Tekken 7’s limited singleplayer campaign and poor tutorials marr an otherwise resounding win".